Elroy was my first attempt at a humanoid robot. I was aiming to make a robot that was biologically plausible and compliant, hence the choice of actuators. I used twisted string actuators to move the limbs. A DC motor is used to twist string that is attached to the joint, which shortens as it twists. To mimic the way muscles work in the human body, I designed the joints so that the actuators formed antagonistic pairs. I used stretch sensors to measure the stretch in each ‘muscle’. The stretch sensors required a Wheatstone bridge and an amplifier circuit to give a usable signal to be read by a microcontroller. 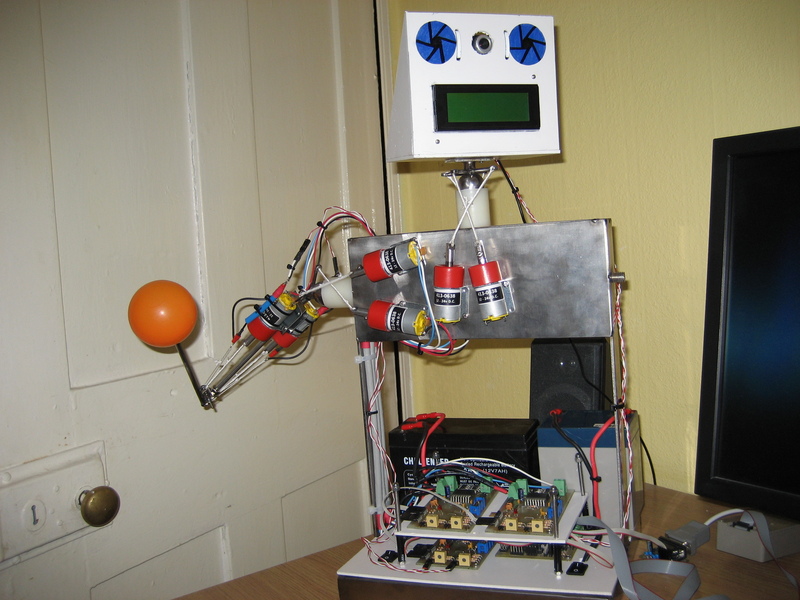 Elroy used 6 microcontrollers and 5 dual h-bridge chips to control and move 10 DC motors comprising a shoulder joint, an elbow joint and a neck joint. A master microcontroller communicated to the other controllers via i2c and also to a PC to allow for higher level control.